The Border Collie has a significant amount of energy in both a mental and a physical sense. Because of this, it requires the opportunity to challenge both the mind and body on a daily basis. The Border Collie is intelligent and easily trained. If given enough physical exercise, the Border Collie can be an ideal house pet and companion. This breed has a tendency to stare and it may do this to other animals or pets in the house. It can be standoffish and defensive around people that it does not know. The Border Collie is a breed that needs to be consistently kept at work both mentally and physically. Without this it can become destructive. This breed has the ability to survive in an outdoor environment in climates that are mild to cool. It prefers to be indoors as long as there is ample space to move around and access to an outdoor yard. The coat of the Border Collie requires minimal maintenance with brushing needed two times each week. The major health concern for the Border Collie is CHD. There are several minor health concerns which include PRA, lens luxation, CEA, PDA, OCD, deafness, seizures, and hypothyroidism. On occasion this breed may develop cerebellar abiotrophy, ceroid lopfuscinosis, or compulsive behaviors. To keep the Border Collie healthy it is suggested that the hips, eyes, thyroid, and DNA be tested. The average life span of this breed is ten to fourteen years. 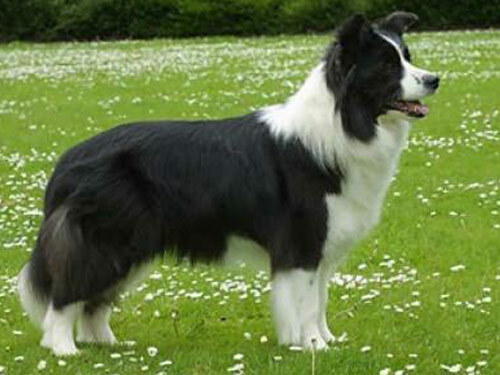 The Border Collie is known for its skill as a sheepdog and was developed through more than a century’s worth of breeding to perfect this purpose. During the 1800s there were several forms of sheepdogs used for herding in Great Britain. These dogs varied in their style as most were used to fetch stock to bring it back to the shepherd. These dogs had a tendency to be noisy as they performed this duty. As many of these dogs were compared to each other, the initial trial of the sheepdog was held in 1873. This initial trial eventually led to the development of the Border Collie. A specific dog named Hemp participated in these trials and produced a significant number of offspring. Hemp was unique in that he was not noisy like many of the other sheepdogs and instead used a glaring eye to coerce the stock into moving. The Border Collie breed views Hemp as the original father of the breed. The first standard of the Border Collie was created in 1906 based on its skills and abilities as opposed to physical characteristics. Because of this, the Border Collie was initially only known as the sheepdog until 1915 when it acquired the name Border Collie from its English and Scottish border starting point. The Border Collie arrived in America to great admiration for its herding abilities. Herders quickly discovered that the breed was very obedient in addition to being a talented herder and this led to the Border Collie competing in obedience trials. The breed remains known as one of the most intelligent breeds today and in the 1990s gained recognition by the AKC after fanciers fought for its recognition.